This article is from July 2014 on presence of security forces in school buildings in Jharkhand before and after the general elections. In recent years, as the presence of security personnel in Jharkhand has multiplied, schools and civic buildings have frequently become the theatre of conflict between the paramilitary forces and the rebels. In the absence of large, concrete structures inside densely forested districts, security personnel use civic buildings, schools, anganwadi for accommodation, and camps. For instance, April 4 onwards, in Palamu, CRPF’s 157 Battalion deputed in Chatarpur before polling made barracks out of the government middle school building cordoning off the school with concertina wire and converting its roof into a watch-post. It was the same in several other districts. 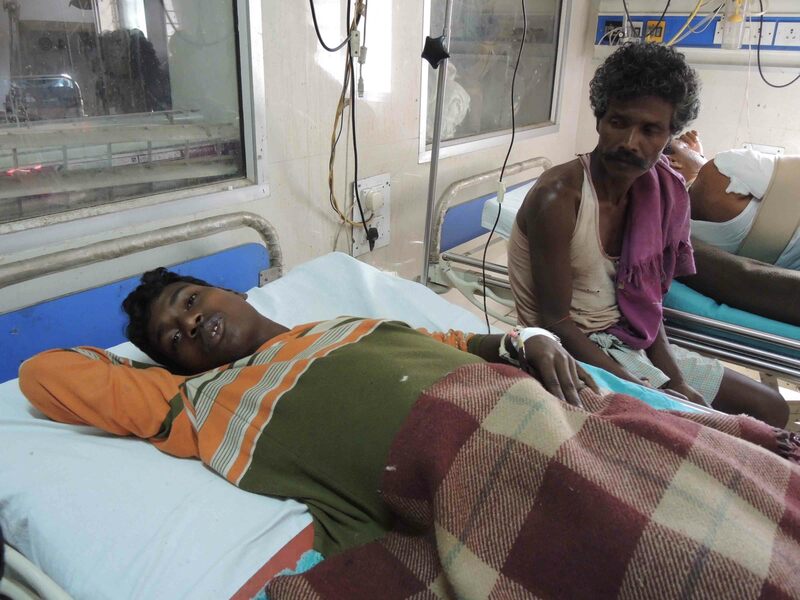 Four days after the second phase of polling for Lok Sabha elections got over in Jharkhand on April 17, the CPI(Maoist) blew up panchayat bhawan in Rajabar in Koderma. The building had been used as a temporary camp by one of the 212 additional units of the Central Reserve Police Forces (CRPF) deputed to keep watch in the state during the Lok Sabha elections. Recently, on June 25, the People’s Liberation Front of India (PLFI), a Maoist splinter group active in western Jharkhand, called for a bandh in all schools in Khunti district citing CRPF’s continued use of school buildings to station troops here. There are instances of classes being disrupted, and overall, this exposes schools to the risk of becoming civilian targets of CPI(Maoist). In 2008, Ranchi-based activist and school teacher Shashi Bhushan Pathak filed a PIL in Jharkhand High Court objecting to school buildings being turned into temporary and permanent security camps. On the High Court’s orders, Jharkhand police furnished a list of 40 schools in 13 districts where it had set up pickets and security camps, including primary, middle, high schools, hostels, schools for visually disabled children. On November 21, 2008 the Jharkhand High Court ordered security forces vacate all school premises by January 2009. Senior police officials say they have since complied with this order. Investigations in West Singhbhum and Latehar, however, reveal the CRPF continue to camp schools buildings temporarily and have even converted parts of schools buildings into permanent camps. Villagers pointed out instances where first schools had been occupied temporarily during elections, and then the same camps being turned into permanent camps later. In Chotanagra in West Singhbhum, a CRPF camp and a thana function at one end of the ground of the Upgraded High School and Residential School for Scheduled Tribes. The school is one of two residential schools catering to tribals villagers from 56 forest villages in Saranda. 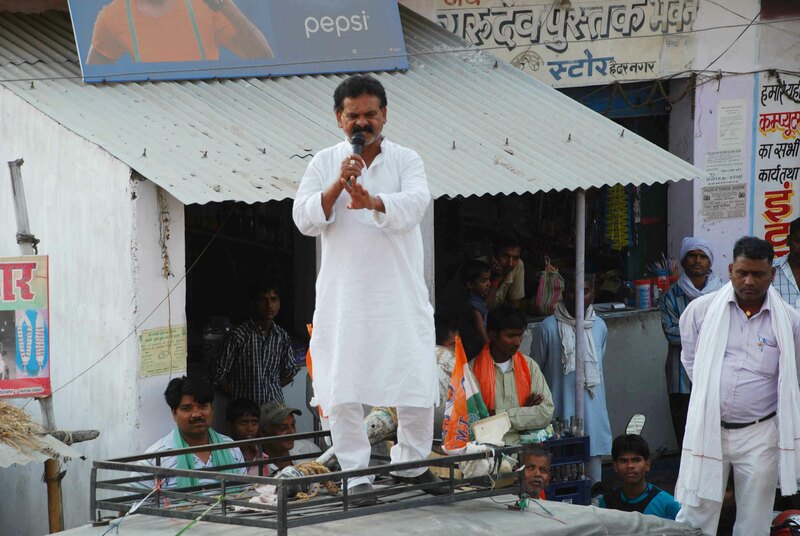 “This space used to be a maidaan where people came to play sports from all over. In 2004, the Border Security Force camped here before general elections and then the CRPF set up a permanent camp,” said Ajay Sahu who runs a grocery shop across the road from the school. A wall in the center of the playground was built a few months back, taking away the students’ access to the playground. “Sometimes the jawans would come to the school to fill water from the handpump, and when the special forces CRPF’s CoBRA, Jharkhand Jaguar visited, they camped in the school at night. Parents of children from Sonapi proposed a wall be built to discourage this as adolescent girls live in the hostel,” said a school teacher requesting anonymity. A CRPF jawan filling water from the school’s hand-pump told this reporter that the jawans had no option but to use the school’s hand-pump, as the camp had an Aquaguard water filter but electricity failed regularly. 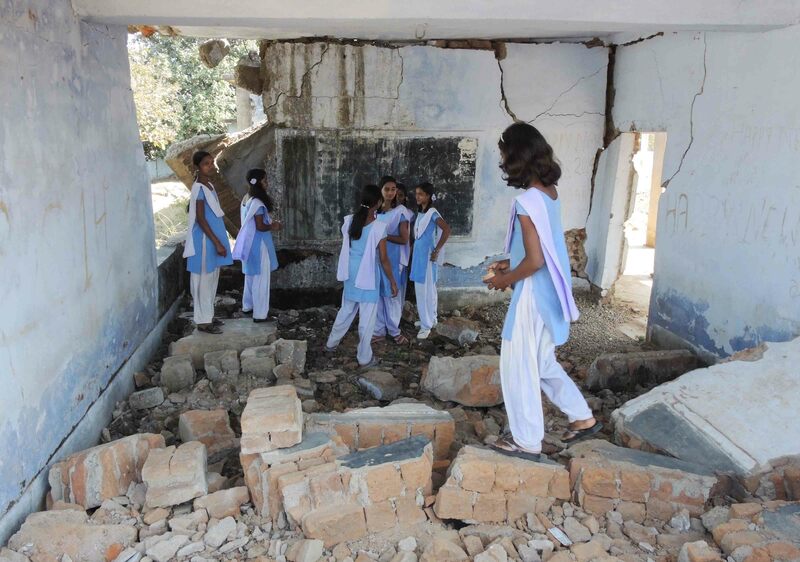 In retaliation for the security forces making barracks out of school buildings in the last few years, the Maoists have bombed dozens of schools all over Jharkhand. In Tiskopia in Bokaro the rebels blew up eight classrooms of a high school for SC-ST children after the CRPF stayed in the school for 45 days during the elections in 2009. School staff recounted seeing iron doors, windows, sports materials, books lay scattered all around the school building, and classes were held under a tree for the next two years. The same year, in Banbirwa, Kone and Saryu in Latehar, they planted bombs and demolished portions of the school building at night soon after they were used by CRPF. 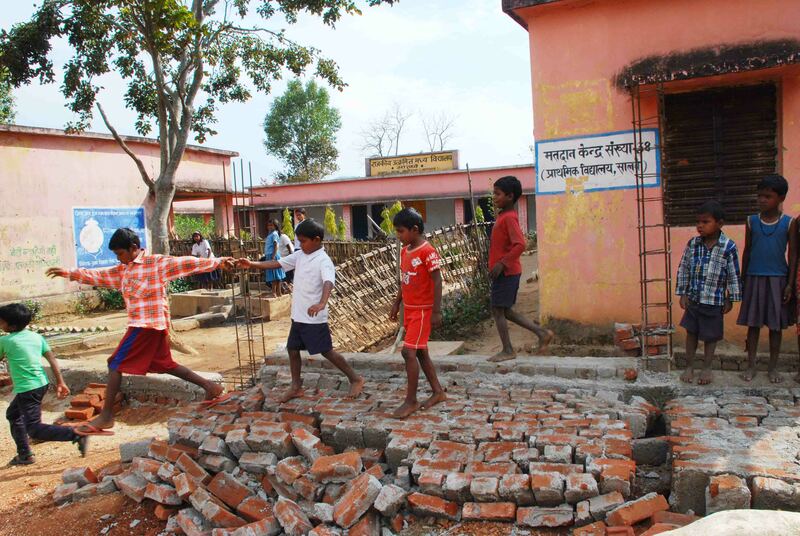 Last march, the rebels demolished the nearly-built boundary wall of the Upgraded Middle School in Garu in Latehar. Schoolgirls who watched from a distance recounted watching the rebels break the wall with their rifles soon after school had got over late afternoon: “Dhakol dhakol ke tod diya. Hum ne Master ji ko duur se aate dekha, aur chilaye, ‘Masterji party aayi hai, bhago! '(They broke it bit by bit. We saw the school teacher approach and shouted out, ‘the “party” (Maoists) are here. Run!’). Vishram Oraon, the village Shiksha Samiti member whom the rebels beat up for allowing the construction of the wall, said security forces had camped at the school during panchayat elections of 2010. In several villages, paramilitary personnel camped temporarily inside classrooms as permanent camps were built in the immediate vicinity of the school. Now camps exist cheek by jowl with schools. In Latehar’s Saryu village, a CPI(Maoist) “liberated territory” till 2009, the government high school staff recounts the rebels would hoist a black flag in the school on republic day. As paramilitary operations to oust the rebels began, the CRPF stayed in the school innumerable times, even as Maoists warned the school staff against letting security forces camp there. In 2009, the rebels blew up the middle school building a kilometer away. Now, a permanent CRPF camp has been set up across the high school playground, while the ground serves as a helipad for the camp. Over 360 students of classes till VIII study in the school, and 87 senior students, including 50 girls. “If additional forces come they still stay in the school but not more than three days at a time. Sometimes they come during school hours to take water or borrow chairs and tables,” said the school principal Chandrashekhar Singh, while he supervised the construction of a boundary wall. “If a wall had been built earlier, perhaps the helipad would not have come here?” mused Mohammad Hakimuddin, a farmer. 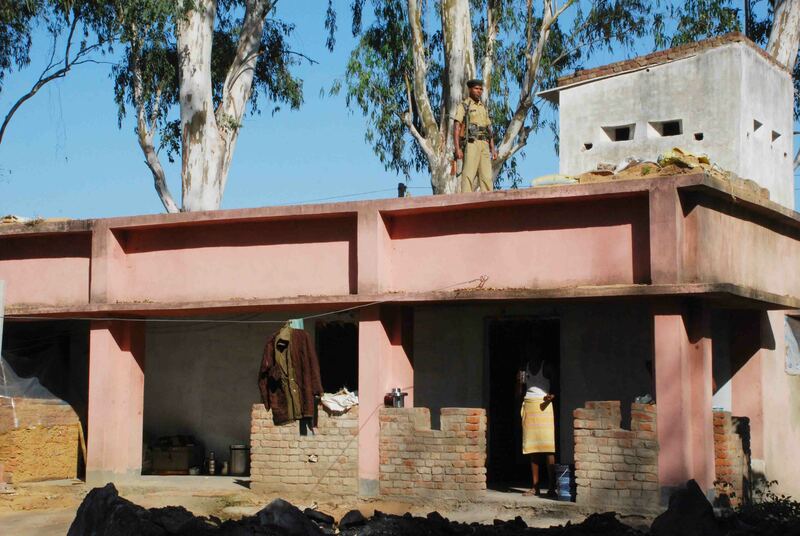 In another block Balumath in village Marangloia, the only government middle school catering to ten villages in Marangloia has served as Jharkhand Armed Police(JAP) camp for the last six years. Police personnel occupying the classrooms complained of being cramped for space as over 100 of them live in five small classrooms. The earthen courtyard of the school was being used by mining firm Abhijeet Group to park JCB excavator machines. After the Maoists set fire to the group’s vehicles in 2012, district officials gave permit even to the Abhijeet Group to park vehicles next to the JAP camp inside the middle school. “The police came to stay in the school when I was in class VIII. 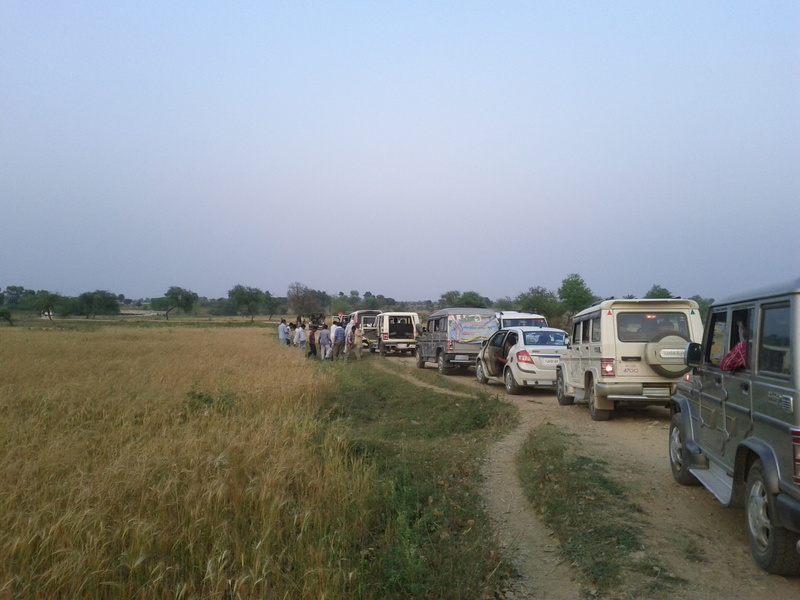 We would find it difficult to go to the toilet because there were no toilets and we used the fields. The jawans would use the fields too. Now they have built a toilet,” said Sangeeta Kumari, who is now studying for a Bachelor’s in Arts at the Ranchi University. The schoolchildren and the security personnel still share a hand pump for drinking water. Jharkhand has a rural literacy level of 61 percent; female literacy in rural areas in 48 percent. The dropout rate in middle school is very high at 48 percent. A report by Human Rights Watch on militarization of schools in Jharkhand and Bihar identifies that government’s failure to ensure necessary infrastructure for the police violates communities’ right to education as schoolchildren must bear with overcrowding and manage in temporary spaces, and girls’ education suffers. Officials either deny, or disagree. “Normally, we stay in the open to avoid staying in schools. Or, we stay in schools which we find abandoned, where no teaching is going on. For instance, in one school where we camped, 100 students were enrolled but there were shrubs growing everywhere,” said a CRPF commandant in Latehar. “To my knowledge there is no CRPF camp running out of a school, or disrupting classes in any way,” said Jharkhand’s Director General of Police Rajeev Kumar. The CPI(Maoist) cadres acknowledge that bombing school buildings as part of “People’s war” has put rural children at a disadvantage but put the onus on security forces’ practice of staying in school buildings. They cite rare instances where the party has helped rebuild bombed schools in their defence. “We demolished the high school building in Tiskopia after the CRPF stayed there 45 days during the 2009 elections. 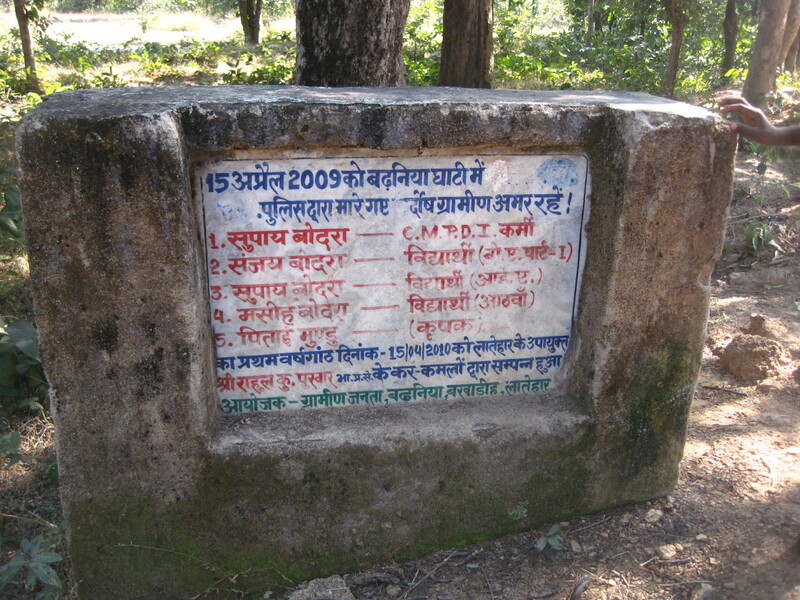 But we contributed when the villagers pooled funds to rebuild it in 2011,” said Rakeshji who leads local guerrilla squads in Bokaro’s Jhumra hills referring to a non-government school for SC-ST children in Gomia block. When asked to confirm, staff at the school were apprehensive of both acknowledging the rebels’ role in rebuilding the school building even as they expressed anxiety over the possibility of the school being occupied by security forces a second time in future elections. It was a weekday when I got a call from Manohar*, an invite to attend a shahaadat diwas in Chotanagpur region the next day. Two months back, Manohar had helped us get in touch with the CPI(Maoist) for an interview. As he said shahadat diwas, a day to commemorate martyrdom, I was unsure if it was the rebels’ leaders’ lives the ceremony was meant to recount, but had little opportunity to ask till I was on the road with him the next day. A few hours out of Ranchi as we reached the forest, the road gave way to a dirt track winding through rocky outcrops. Mahua trees were in bloom, its yellow fruit scattered on the ground. Sal was sprouting fresh green leaves. Vote ke jariye sarkaar ke rang badalta hai, shoshan-shaashan bandh nahin hota hai – Bhakpa (Maowadi) “Voting will change shades of governance, not repression,” the banned CPI(Maoist)’s message for boycotting elections scrawled in large brown letters on the wall of a hut painted white. The hut’s inhabitants went about their routine. The path soon gave way to a large clearing. Here, at the base of a hill, the villagers – men dressed in white shirts and dhoti, women in sarees, musicians with drums, dancers with plastic flowers in their hair – were under one tent, and in front of them were two six feet-high statues under a bright blue and yellow canopy. It was only then that it became clear the farmers from several villages around the hills had gathered to celebrate the lives of two of their ancestors, whom they described as the first from Jharkhand to fight the British. They recounted that Bakhtar Say and Mundal Singh had been executed to their deaths defeated by the British in April 1812 – nearly 45 years before what I had learned in textbooks to remember as the first year of Indians’ rebellion against the British, the Mutiny of 1857. “Bakhtar Say and Mundal Singh of Navagarh and Panari Pargana amar rahein,” began Govardhan Singh of the village path pradarshak samiti that has been organizing the function every April. Who were the two? What had they done? Was their any direct link between the Maoists’ presence in the area and this public ceremony? And how did this affect the politics, voting of these interior villages? I wondered as I watched ceremony those gathered had organized to honour their first freedom fighters. Bakhtar Say and Mundal Singh, two landowners, fought against the British in Chottanagpur region 1812 onwards. When the British government ordered Govind Nath Shahdeo, the king of Chotanagpur, to pay Rs 12,000 as tax to the East India Company, Bakthar Say refused on behalf of the peasants of the area Navagarh Raidih. This provoked a fight in which Bakhtar Say killed Hira Ram, the Ratu courtier sent to collect this tax. The magistrate of Ramgarh then sent an army from Hazaribagh under Lieutenant H Odonel, while reaching out to the kings of Jashpur and Sarguja (in present-day Chhattisgarh) to surround Say from all sides. At this time, Mundal Singh reached Navagarh to help Bakhtar Say. The battle lasted two days. Say’s armymade up of farmers of the area held off the British, something the kings and rulers of Navagarh, Panari, Gumla had failed at. But a month later, E Rafreez of Ramgarh Battalion planned a second charge against both leading a large army. This battle lasted three days. Say and Singh were forced to seek shelter with Jashpur ruler Ranjeet Singh. The latter betrayed their confidence and they were arrested and taken to Calcutta where they were executed on 4 April 1812. A Google search for the two’s names to read or corroborate for oneself yields nothing. The sun climbed higher but the people kept coming in hundreds. By late afternoon, the numbers had increased to thousands. 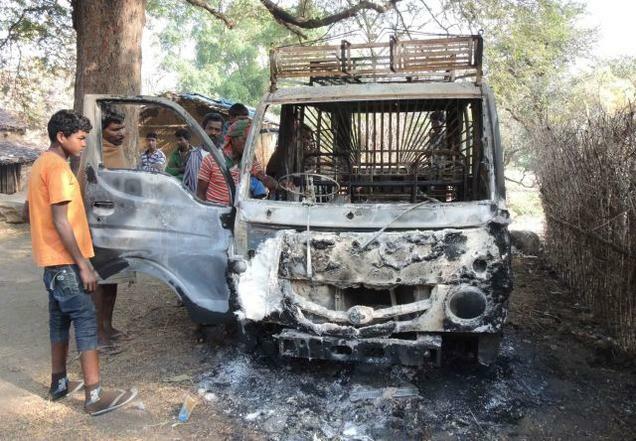 Those who took turns to speak paid homage, and compared Say and Singh’s revolt to the struggle of tribal villagers who sent several years in jail in Latehar and Chaibasa prisons charged by forest officials for collecting firewood from forests. Others compared the struggle of Say and Singh against the British in the 19th century to the displacement of lakhs of Jharkhand’s tribals in the last hundred years, reflecting the feeling many describe as Jharkhand’s “repeated colonisation” – first by the Biritish, then ruling governments, and now large mining firms. “Political leaders visit and try as may to talk sweet, they will have to answer about our displacement,” Munna Kisan, the village shahadat diwas committee convenor, a frail old man wearing a white shirt over dhoti and canvas shoes spoke animatedly. Manohar, who was in jail on charges of being a Maoist, asked questions that have been absent from the political and TV debates preceding elections – why do a majority of women in the country still have khoon ki kami (anaemia), if even a single school or wells had been built in the village every year since Independence would things not be different, why were gram sabha resolutions on use of land and trees flouted despite Constitutional provisions, were leaders living in Delhi capable of ever understanding the lives and priorities of Jharkhand’s villagers? As the villagers watched, several young men dressed in shirts and trousers came and watched from afar. The organizing committee members identified the men as from the local squad of the CPI(Maoist). The carnival grew bigger. The karam dances grew more vibrant. The festivities would go on all night, Nagpuri artists were expected to perform at night. 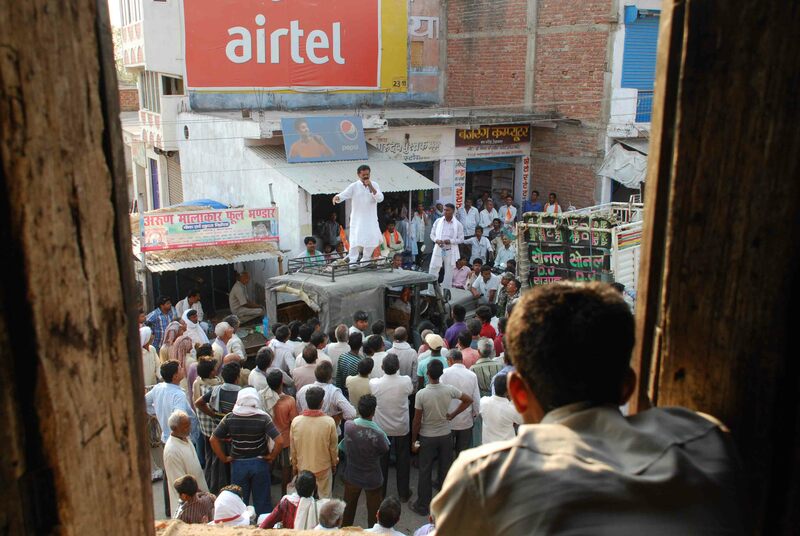 The villagers said they had collected over one lakh rupees to organize the meeting. The “party” (Maoists) had contributed additional funds. To celebrate two martyrs the villagers associated with the Indian freedom movement, I wondered. “They maoists are samaaj sewi (social workers), except they carry guns,” offered the panchayat’s young woman mukhiya when I asked her about the presence of armed squads in the hills surrounding the village as we shared a big lunch of dal, rice, tomato chutney, and washed it down with sattu (gram flour, water). When I asked if the rebels had tried to constitute committees within the village as is common in pockets of Jharkhand and Chhattisgarh, she said the krantikari kisaan samiti had existed since several years but had made no active effort to carry out public works in the village. The perfectly amicable relationship the villagers seemed to have with the Maoists, panchayat institutions, as well as large NGOs operating in the vicinity of the villages seemed an unusual co-existence, peculiar to Jharkhand. But will the alliances of those with similar aims though different strategies here survive and evolve to question future rulers and governments?